The only negative thing about this book was that I waited so long to read it. Which, is sorta in a compliment in and of itself, because I didn’t want the series to end, so I just put off reading the last book. But then again, I’m kicking myself, because I didn’t realize that Bec McMaster is a literal powerhouse and has published books from four different series since I discovered her with this London Steampunk series and all of them have piqued my interest (and has infiltrated my library’s hold shelf). 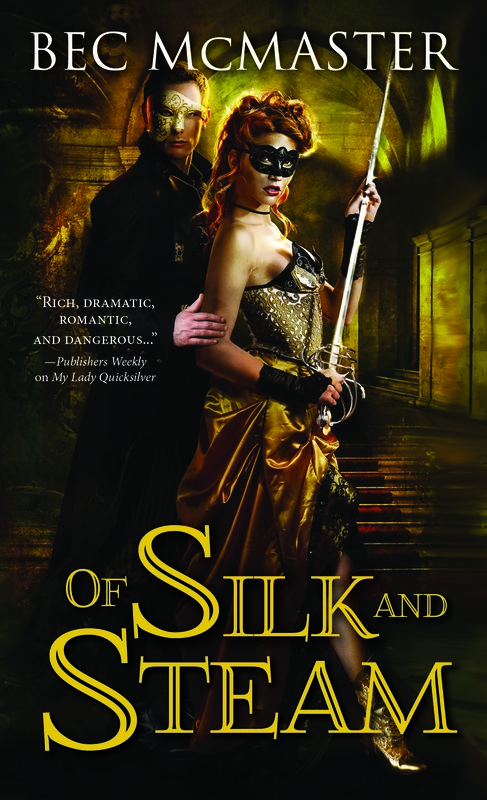 So why did I wait so long to read Of Silk and Steam? Especially when it was just so freakin’ good? It took a little warming up, to remember exactly what was going on with the overarching plot, but to finally see Leo and Mina come together was really rewarding. Mina was such a strong character who I couldn’t help but admire and Leo? Well, Leo had everything that I love to read about when I read a romance, because I want to fall in love, too. And with his flirtatious nature, strong qualities, stubbornness and surprising vulnerability, it was hard not to. I think my favorite aspect of this entire series is the worldbuilding. McMaster is one of the first writers to truly get me into steampunk and she does it flawlessly. I also loved seeing so many of my favorite characters from the previous books in the series within this one, particularly Blade, Honoria and Will. It was like returning home after being gone on a very, very long holiday. I’m also always blown away with how romance writers, especially ones like McMaster, get me so damn invested in these characters. There was a point, within Of Silk and Steam, where I literally started flipping through pages trying to see how long it’d take before [spoiler] was resolved, because I didn’t want [spoiler] to continue believing [spoiler] and continue holding it against [spoiler]. I had to put the book down and tell myself to just read it and then I’d find out if their budding relationship can be salvaged or not. Needless to say, I’m glad I finally read this book. It was a great way to wrap up the series and it was lovely to return a world that I fell in love with so deeply and was so curious about. It’s kinda sad, to not be part of this world anymore (although her Blue Blood Conspiracy Series apparently picks up a couple years after this one and I just found that out doing a little fact checking for this post, so guess who is completely and utterly jazzed about that!?!) I’m super excited to continue getting a chance to read McMaster’s work through her other series. If you enjoy steamy romance with three-dimensional characters who make you fall in love with them yourself, definitely give this author a read.